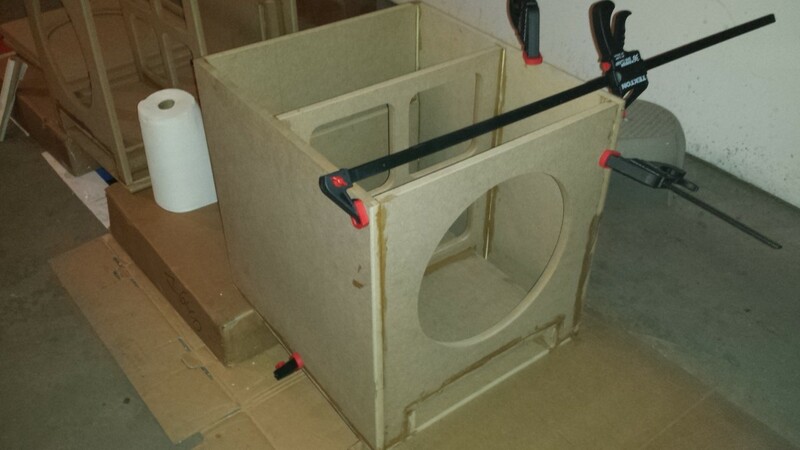 I've just started the process of building 2 ported subs for nearfield in my basement theater. The packaging of the kits was epic. The best packaging job I've ever seen of anything ever shipped, no joke. 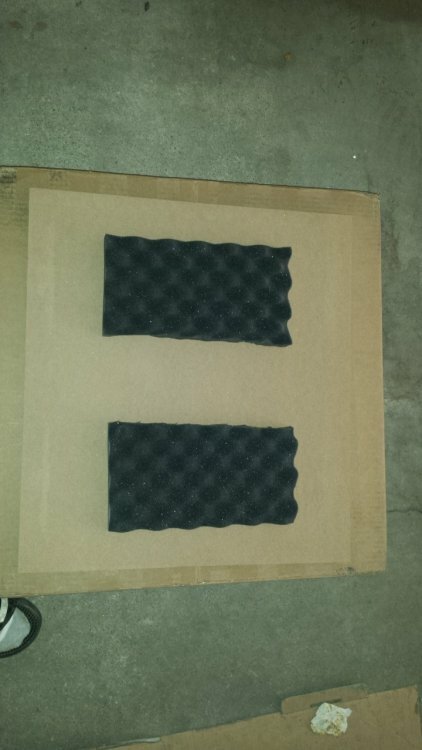 In heavy boxes, wrapped in plastic, with foam guards in the box and then wrapped around the panels. Dryfitting the boxes the panels fit not close, but absolutely perfectly. The kit has dado grooves and rabbet joints which make it so a rookie can fit the panels into place exactly right, and if done corectly, have no trimming of the box necessary when complete. The driver fits the cutout, which was a small ?. Perfectly fits it seems. Depth is also OK, it looks to me that there is 11 or so inches of depth before the bracing panel. The driver itself is amazing, the heaviest I've had including my 18" Ultimax subs, and this is a 15". Very nice looking too. I will take some pictures as I go along. 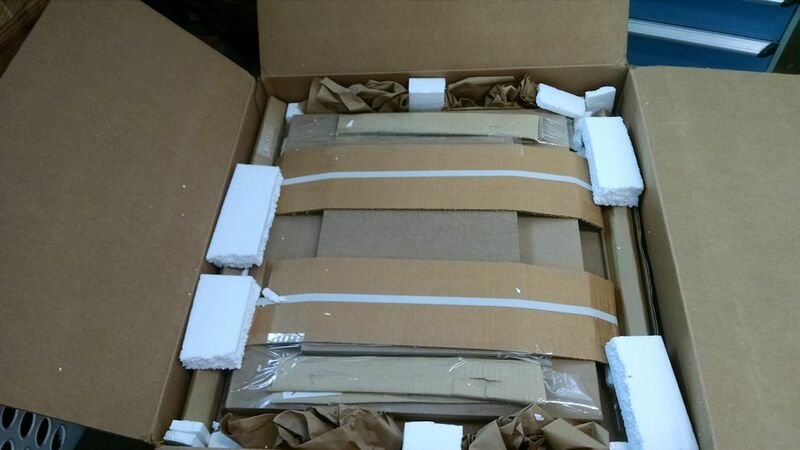 Pic 1 is from another site but is same, what the box looks like when opened. 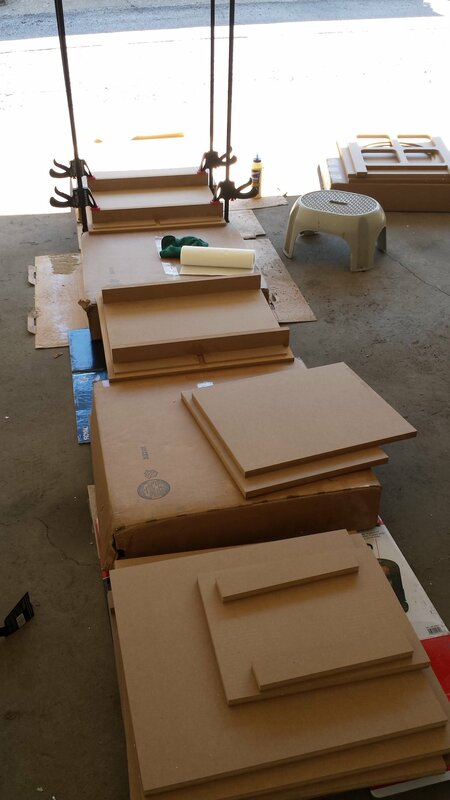 Each kit comes in 2 boxes for shipping weight purposes. I had 4 of these boxes. 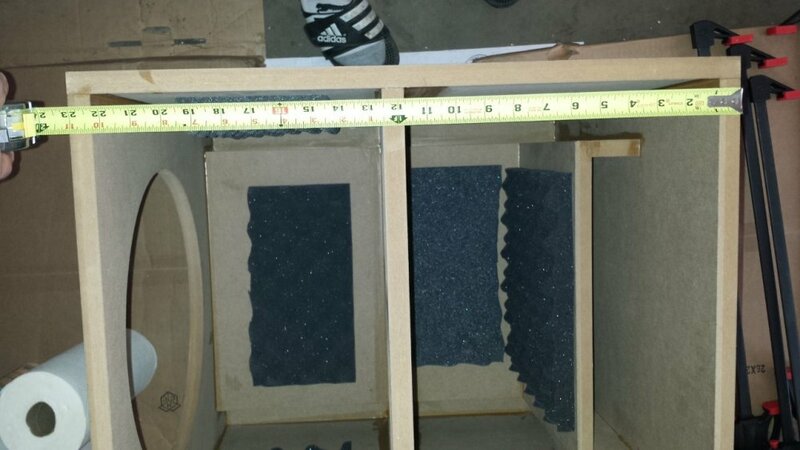 Pic 2 Showing one of the sub being built. Base is down, side rails attached. Like most things take your time and line it up perfectly so that future steps will go without issues. I'm looking forward to seeing this build come together. I think that's a great looking driver...reminds me of the driver that Rythmic uses in their 15" subs, but with an even stronger motor. This should be a fun build. DIYSG makes some nice boxes and the project should go well. We love pic's along the way. Putting together the two subs is tiring, surprisingly to me. I'm in great shape, but in the warm garage, stooping down, putting on glue, moving it a bit, clamping it, wiping, adding a clamp etc....it adds up to a lot of work! And a lot of fun. I really, really have enjoyed this process. I was extremely careful putting on each piece, making sure it dry fit, making sure I understood how it was supposed to go. I carefully added a finger of glue to each seam in order to insure everything was sealed, both inside and out. For a rookie, the scariest thing is when you first put on a side panel. Because even though the back panel may have been installed "perfectly" vertical, putting on the side panel shows that it was actually off by 1/4" (1 of them) or 1/8" (the other one). 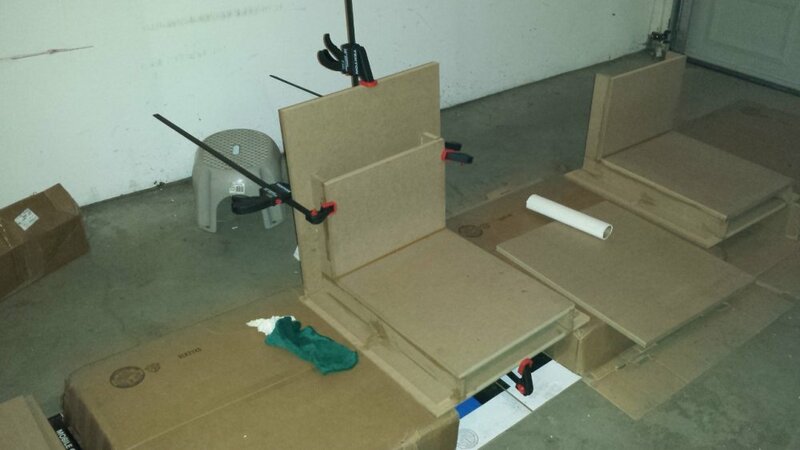 So when adding the side, the clamps are used to gently pull the other pieces into place. I can see why some would build the entire cabinet quickly with a brad nailer, then let it set. In that regard, the panels wouldn't settle quite so strongly. But it worked and worked great. I cannot believe how well this cabinet went together. It's extremely close to needing no fill at all -- just sanding. There are maybe one or two seams where it's off by enough -- 1/16 or something of that nature that sanding alone may not be enough. Otherwise, it went together amazingly. The second scariest moment (imo) was the double baffle. I could line them up very easily by using the port actually -- the port has 4 sides and by lining those up, it insures the rest of the panel lines up too. The top was actually a bit more difficult to get exactly right than the second baffle. More pics on the next post. Great job Rob. I'm going to want a demo, lol. Of course, I load the first few pictures in order, and they show up backwards...so I loaded the last set of pictures backwards...and they showed in backwards order. For a man with a computer degree from many moons ago, you'd be hard pressed to tell. A few comments for rookies -- first of all, you cannot have too many clamps. I have 4, all big enough to fit around the sub. 4 is the minimum. 6 or 8 is actually ideal for one sub imo, although more is fine also. Having a set of 4 simply means that I could do one panel at a time. Doing 2 of each, by having 2 subs, is a no brainer - redo what you just did. I highly recommend any rookies undertaking this make at least 2 at a time, even if for a friend. No reason I can think of to make just one unless money is so tight that's all you can do. I'd also comment that it's a bit trickier than it looks to do all this. Not difficult, but you are learning to work with wood glue, clamps, and have one real shot to get it right each time. The glue takes a while to tack up, which is a good thing. 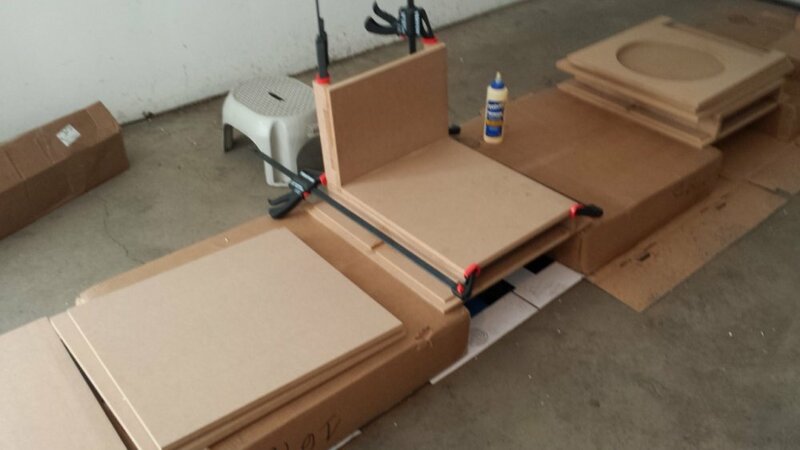 Apply to each side of the panels being attached, relax and don't worry that you'll run out of time. When you connect them and they are still very wet, they will slide around a lot, but once the glue begins to tack, it will hold fast and eventually become difficult and then impossible to move. 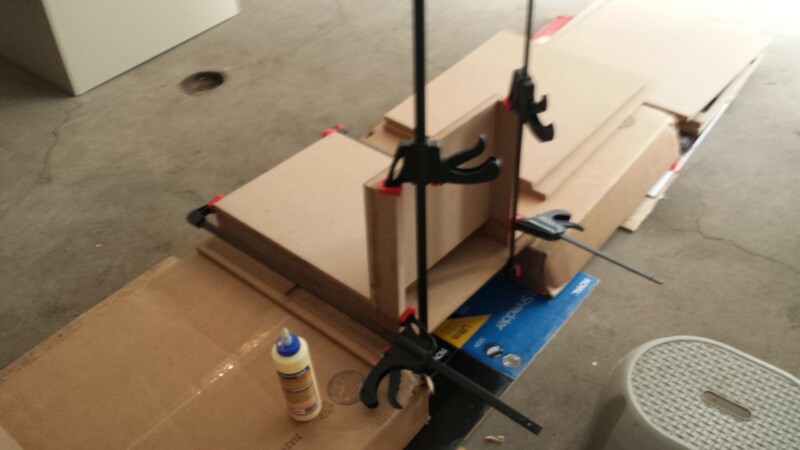 Clamping rookie tip -- when trying to make sides line up, use a clamp. The clamp is what I used to gently pull panels together that were slightly out of alignment. Clamping gently, and then slowly tightening the clamps seems to be an important key. I noticed that I did not take pictures of the completed cabinets with both baffles. I'll take some pictures later today or tomorrow with those. They are both complete and dry at this point, ready to begin finishing. 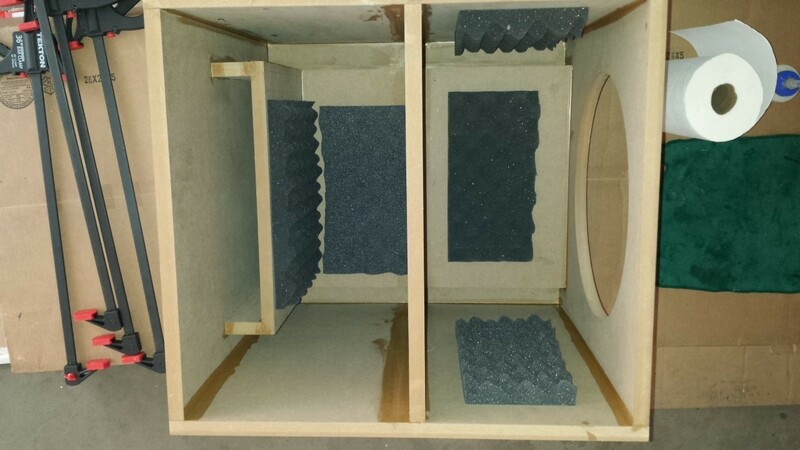 A few of the pictures below have measurements -- I took those for me and for anybody else that may be curious the spaces inside the box when built. The depth allows for the driver I selected, and has plenty of room and when I dry fitted at least, fit the cutout perfectly. I still need to test the cutouts and also test the drivers to insure they work sometime soon. Finishing will be first and hopefully complete within a week. I also have a DIYSoundgroup sub, the Reference 15. (Erich sells the CNC cut enclosures to Parts-Express). I would not have glued the sides free-standing. If you glue four panels together securing with clamps it is much easier to get them square. Since you are going with 2 subs, I presume am Inuke 6000 DSP is in your future? Late this evening I plan on running by Home Depot to pickup a few finishing items. 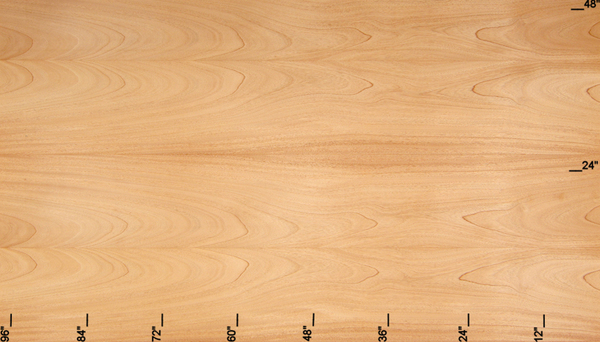 I ordered some wood veneer with PSA backing last night from oakwood veneers. I was originally going to use contact cement and a 20mil backer, but thought about it a bit more. #1, I don't want more tools. The PSA skips the glue, glue application and stink of the glue which I like. The cabinet needs to be very well finished and with few imperfections which it already is. A few seams may need some filler and of course some sanding. So I need a good filler -- recommendations? Second, I will be priming the cabinet with a sanding sealer of some sort...again a recommendation is very welcome! also roll on, brush on....spray? I know I need a spackle tool to apply and smooth the filler, I have some sandpaper already...anything else I need before prepping for veneer? The picture is the laminate that the wife and I agreed upon. Very nice version of a Mahogany like finish we thought. And nicely inexpensive for a first build. 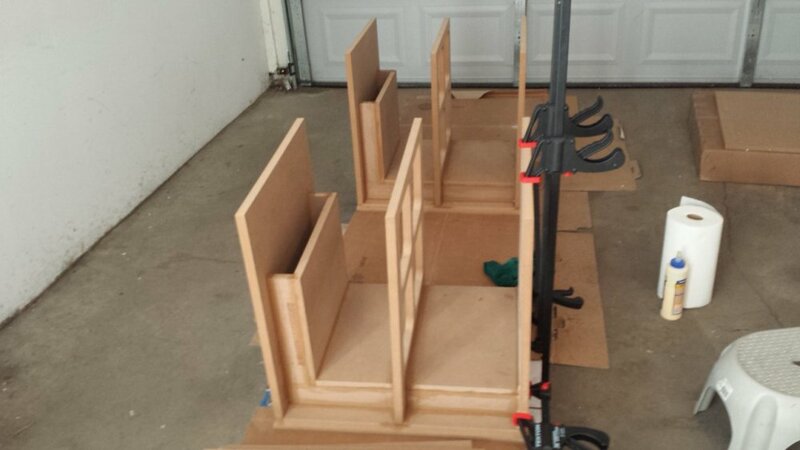 I ordered enough to have a few extra panels worth for practice and staining testing. If you have a recommendation for a potential stain -- clear, light or dark, I welcome that too thank you! Bondo is a great filler. Wow, you're really moving on these. 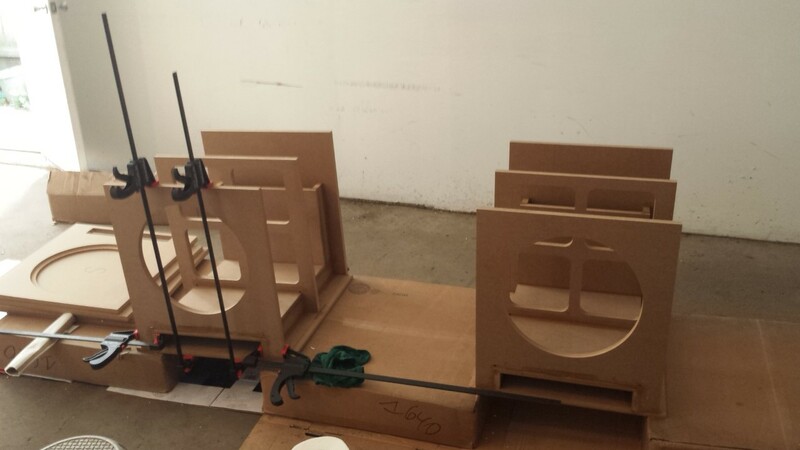 Looks like they're coming together really well and I bet that mahogany veneer is going to look fantastic. My sub had only one small low spot so i just used a bit of regular wall spackle to fill it in. I wasnt too worried about the bond between the spackle and MDF since it was just one small low spot. I probably would have used bondo if it were any bigger or closer to the edge, but I hate working with that stuff due to the smell. I am planning to use Tried and True Stain + Finish which is a polymerized linseed oil (http://www.triedandtruewoodfinish.com/products-landing/stain-finish/). I chose that because I'll need to do my finishing inside our home and i didnt want to stink up the place with fumes. 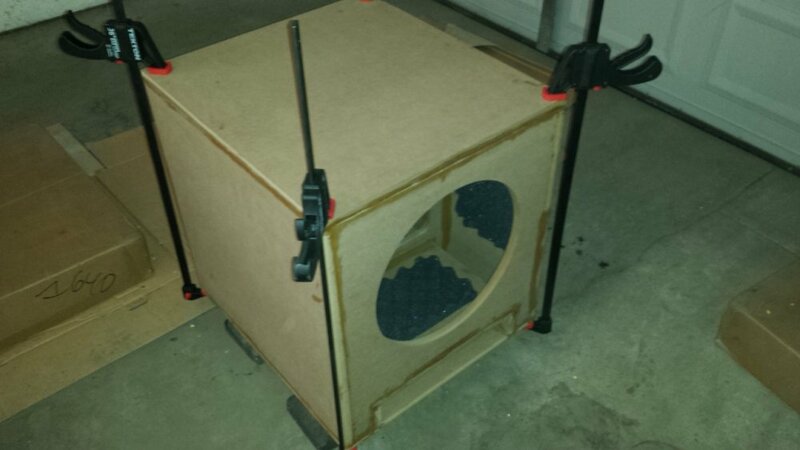 If i had a ventilated climate controlled space, i probably would have gone with regular minwax stain and polyurethane like what Scrappy did on his recent speaker build. Do you have a veneer scraper? I used this one http://www.veneersupplies.com/products/Veneer-Scraper-for-Backed-Veneers.html# and it worked well. Depending on how much filler is needed, a good sanding may be in order. Harbor Freight sells orbital and belt sanders. This is much better than doing it by hand. My sub had only one small low spot so i just used a bit of regular wall spackle to fill it in. Hopefully it won't let loose. I probably would have used bondo if it were any bigger or closer to the edge, but I hate working with that stuff due to the smell. And for some reason I love it. None of the seams are too shallow where they need filling. There are maybe 4 that have a slight overhang of around 1/16" beyond being flush. I could try and sand it all down to the right level, or fill beneath the overhang with a gradual slope of wood filler or bondo. I thought filling the little bit of overhang would be easier and a better result? The kits really were key in having such a nicely finished box without having to cut anything off. That's the fun part in this, you make the calls in the building process. Either way a good even sanding is the endpoint. 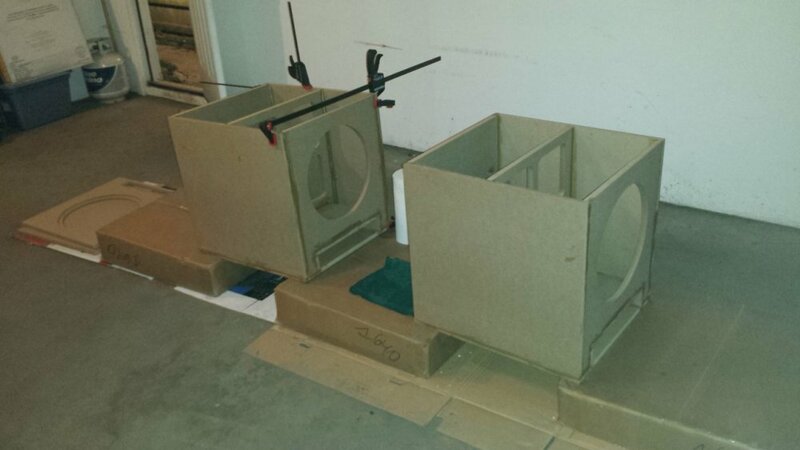 Building the sub or kit does not take long. 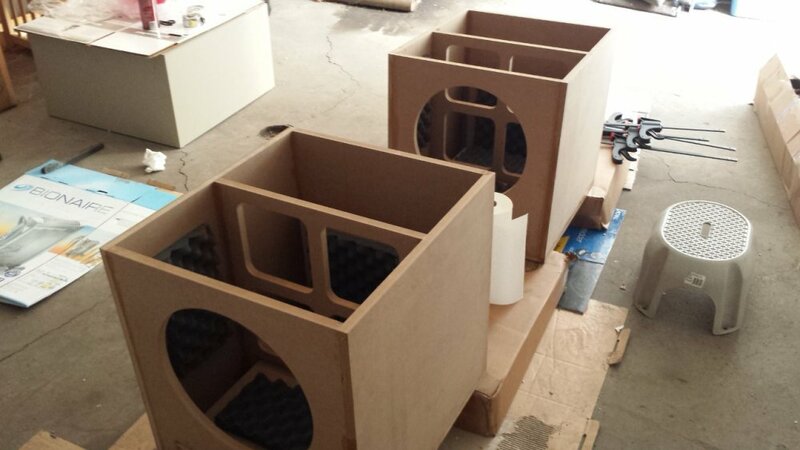 Working on the finish can be the longest part of the build. I used a chisel to take off a few high edges. The edges i took down were very slight to where they were more easily felt than seen. Its easier to sand off an edge than it is to sand down the whole panel to line up with the edge. Make sure the work is flat, imperfections will show right through the veneer. Def would be easier but id need more than 4 clamps to get it right i think. Slower was good for my first build. I have an inuke6000dsp. I will split it actually so the big 18ultimaxes get 550rms 750peak at 8 ohms and the new subs get probably 500 to 1000ish at 4ohms. Over time i may add another amp but ive tested up beyond 105db and the nuke never has hit 3 lights with my 2 subs. Ive learned watts arent that key for ported like they are sealed. Ill place the pairs symetrically so distances and dsp are identical for each set. If more dsp needed...another amp eventually. But ive tested every spot in my room in REW and know with 4 placed well the dsp will be minimal.